What is Ready To Read? Through the Library’s READY TO READ program, nearly 6,000 Early Literacy Kits are provided to over 25 organizations in St. Charles County that serve children ages 0-5 each year. These kits provide children and their caregivers with information about literacy and the Library as well as three children’s books with the goal to help the youngest members of our community grow into lifelong learners. We also create and maintain community Mini Libraries, providing access to books, manipulatives, and literacy materials for the children of St. Charles County. To date, we have established over 25 Mini Libraries. At the core of the Ready to Read program is the belief that reading is an essential skill, impacting everything throughout life. We also believe learning to read begins at birth and parents and caregivers are a child's first and best teachers, regardless of their reading background. Lifelong learning is a core value of the public library. Libraries are partners in supporting parents and caregivers as they develop early literacy skills in children from birth to age five. Literacy-related activities in the formative early childhood years are highly correlated to a child's success with reading. Early and enjoyable pre-reading experiences set the stage for a child's desire to learn. The best interventions begin before kindergarten and start in the home, supported by partner agencies such as schools and libraries. By participating in developmentally appropriate reading activities, children gain knowledge that will serve as the foundation for further learning as they enter the school system. The Library Foundation has a substantial investment in community literacy outreach to children under the age of five years since they make up 6.3% of the St. Charles County population. Moreover, we have a focused effort in our outreach to fragile families and children living in poverty. 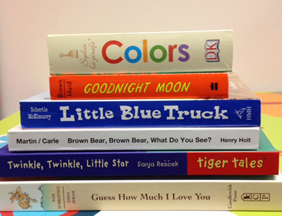 We know 61% of low-income families (nationwide) do not have age-appropriate reading materials in the home. 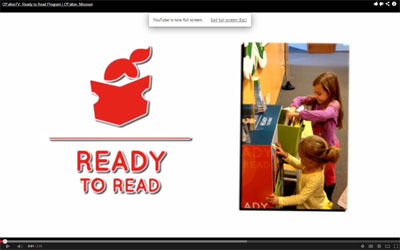 The Ready to Read program provides high-quality literacy materials from the beginning of life, providing access and enabling families to grow readers. What does Ready To Read provide? Want to support Ready To Read? VOLUNTEERS: Volunteers regularly deliver Early Literacy Kits to our partner locations and maintain mini-libraries throughout the county. Our dedicated volunteers are the heart of the Ready to Read program! HOLD A BOOK DRIVE: Individuals or groups hold Book Drives throughout the year. Book donation events allow us to provide additional materials for mini-libraries and support many special occasions throughout the year. Click here for details on hosting a Book Drive. SPONSORSHIP: Individuals, groups or corporations provide sponsorship for the Ready to Read program at various levels. This support has allowed us to create mini-libraries and expand to new partner sites. COMMUNITY PARTNERS: Do you know of an organization that would benefit from the Ready to Read program? We are always looking for additional community partners to receive Early Literacy Kits and/or support a mini-library at their location. 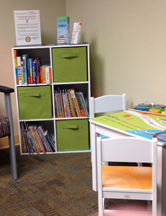 Our mini libraries allow kids to enjoy books and educational toys in 35 partner locations across the county. We appreciate the wonderful new books donated through book drives hosted by businesses, service organizations, scout groups and others who want to help the Library Foundation's literacy initiatives. 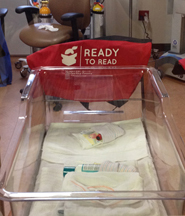 The key to reading proficiency is to start early...the day your child is born! An early literacy kit helps new parents prepare for their role as their child's first teacher. Make a Gift to Enhance Literacy!